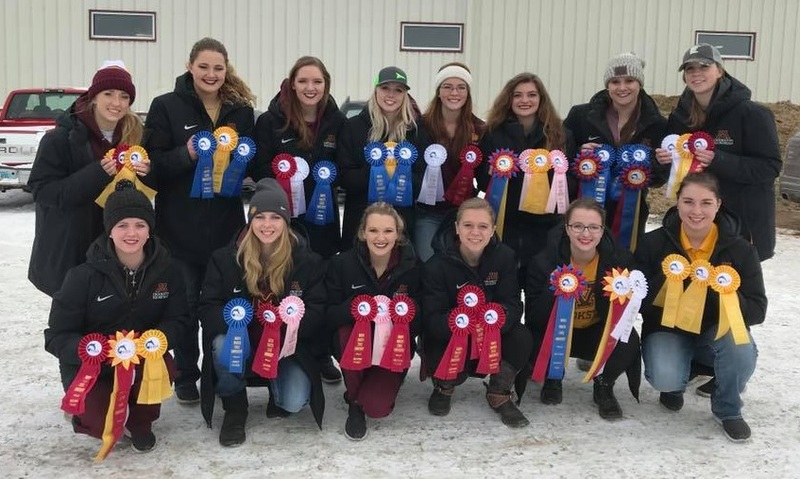 RIVER FALLS, Wis. – The University of Minnesota Crookston western equestrian team competed in three shows at the University of Wisconsin-River Falls Nov. 30, Dec. 1, and Dec. 2 in River Falls, Wis. The Golden Eagles were High Point Team Sunday and Reserve High Point Team Saturday. In Friday’s show, Megan Motter (Sr., Cooperstown, N.D.) earned High Point Rider for the day. Friday’s competition opened up with Motter finishing second in the reining, while Whitney Fenna (Sr., Foley, Minn.) finished fourth. In Open Horsemanship, Motter had a flawless ride in order to bring home the win in her section. Fenna also had a solid ride, taking home fourth. Motter took home High Point Rider for the day with her phenomenal performance. In Advanced Horsemanship, Shayla Marthaler (Jr., Osakis, Minn.) placed sixth in her section , while Madeline Drayna (Jr., Milaca, Minn.) took home second in Advanced Horsemanship. The Novice Horsemanship riders all put together strong rides Friday. Rae Ann Michel (So., Monticello, Minn.) led the way by taking third, while Jordyn Newberg (So., Deer River, Minn.) placed fourth. Alyssa Evavold (So., Battle Lake, Minn.) pulled in a well-ridden second place, pointing her out of Novice and into Advanced Horsemanship. Whitney Weidenborner (Jr., Bemidji, Minn.) rounded out the Novice division for Minnesota Crookston by finishing fourth. The Intermediate riders rode well but did not have their strongest showing. Kathryn Crum led the way by taking third in her section. April Klecker (Fr., Amboy, Minn.) and Beatrice Streifel (Fr., Hawley, Minn.) each took home fourth, Tristyn Hoechst (Fr., Winnebago, Minn.) finished fifth, while Jayde Proffitt (Jr., Winsted, Minn.) was sixth. Savanna Weber (Fr., Silver Lake, Minn.) concluded the day by taking sixth in Beginner Horsemanship. Motter opened up Saturday’s show by taking fourth in the Reigning, while Fenna placed sixth. In Open Horsemanship, the riders made up ground with Fenna winning her section and Motter finishing third. The Advanced Horsemanship riders all had solid rides with Evavold making her Advanced debut and winning her section. Drayna finished third to point out into Open Horsemanship, while Marthaler also took third in her section. In Novice Horsemanship, Newberg placed second, while Michel took fourth, and Weidenborner fifth. Weidenborner’s placing helped point her out of Novice and into Advanced Horsemanship. The Intermediate riders had stellar performances on Saturday. Crum won her section, while Proffitt took second in her section. Streifel picked up yet another win in her section as she pointed out into Novice Horsemanship, while Hoechst took sixth in her section. Weber had the best showing yet of her collegiate riding career, as she finished with a confident second in Beginner Horsemanship. The strong day for the Golden Eagles catapulted them to Reserve High Point Team accolades. Sunday’s show opened up with Motter placing third in a very deep Reining class. Fenna was just shy of placing for the Golden Eagles. In Open Horsemanship, all three riders performed well with Fenna placing second, Motter fourth, and Drayna sixth. It was the Open debut for Drayna, who pointed into the class on Saturday. In Advanced Horsemanship, Evavold pocketed another win, while Weidenborner finished with a well-ridden third, while Marthaler took home fourth. In Novice Horsemanship, Newberg put together a beautiful ride to finish first, while Streifel placed third in her first day in Novice. Michel finished sixth after a challenging draw. In Intermediate Horsemanship, Klecker took first with yet another extremely confident ride. Hoechst placed second with one of her best rides yet, while Crum took third, and Proffitt fifth. Weber rounded out the day by placing fifth in Beginner Horsemanship. The Golden Eagles had a great day overall on Sunday as they finished as the High Point Team for the show.